Let’s start with the hard question. 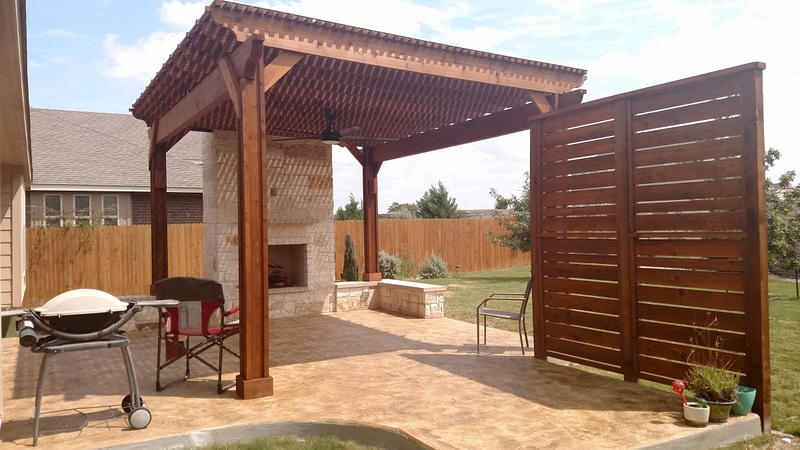 Do you feel like your budget might stand in the way of you having a new and/or improved outdoor living space? Almost everyone is budget-conscious these days, and we understand that may mean different things to different people. 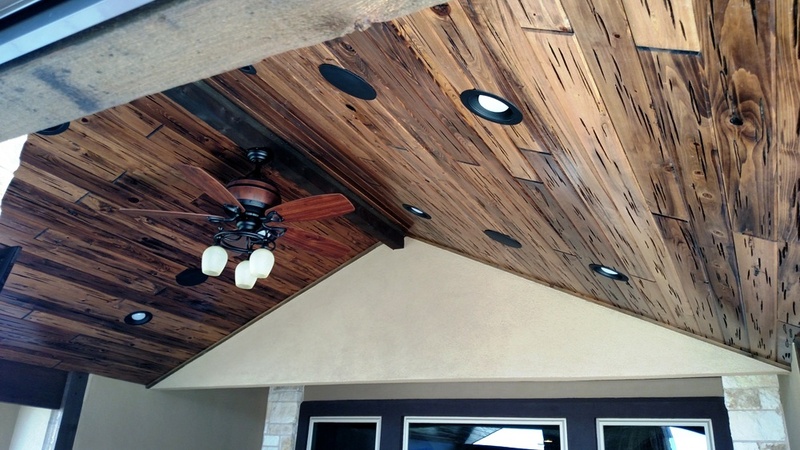 But if you feel your budget is keeping you from having the outdoor living project you really want, Archadeck of Austin will work with you “every which way” to try to make it a reality. 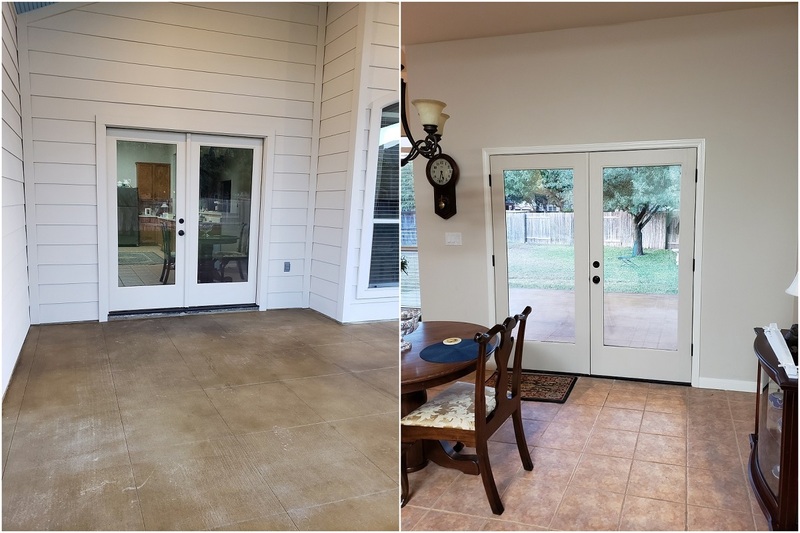 Before we look at today’s combination-outdoor-living-project-on-a-budget, let’s talk about the process we go through to arrive at a quote for a job. First, after we listen to what elements a client wants included in their project, and we offer our suggestions, we have to be able to tell them how much it will cost. If the number is too high, we’ll look at choices the client can make — maybe different materials, maybe scaling it back a little bit — to bring the price down. We don’t expect the client to sign a contract until we quote them a price they are comfortable with. The price we quote is the actual price the client will pay. Does that surprise you? It should not. But we’ve heard about other contractors (not Archadeck) who quickly low-ball a quote just to get the contract signed. They may not take the time to do the necessary research about materials costs, etc., to give a semi-accurate quote. The client doesn’t realize some costs have been left out of the conversation. Oh, yes, they find out eventually, when the job is half-completed. What choice do they have at that point? 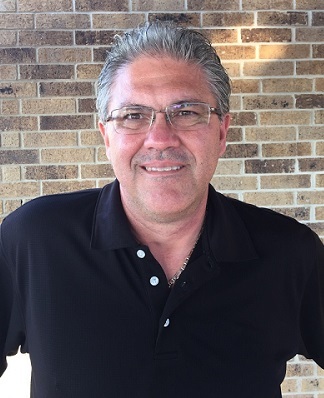 They approve the additional costs and end up paying more than they would have if they’d gone with a higher (accurate) quote from a professional builder like Archadeck of Austin. 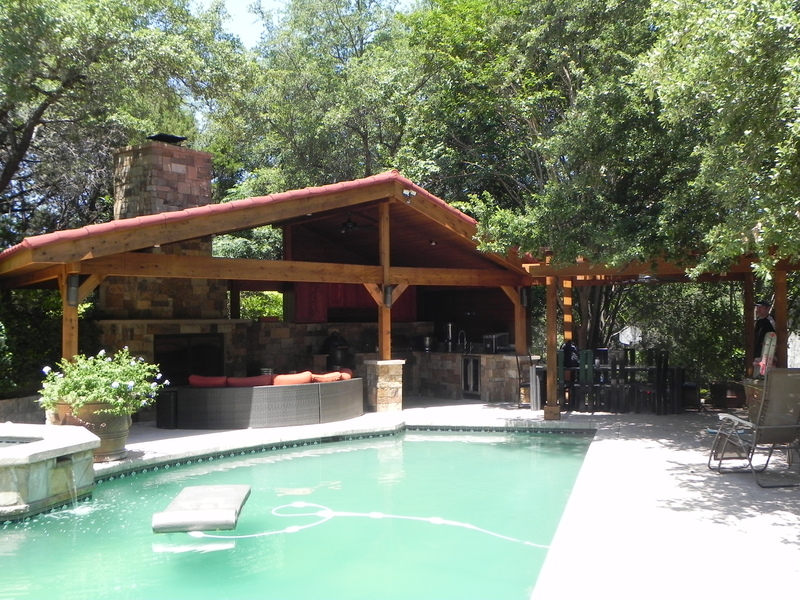 Today’s featured project is in Austin, TX, and it’s a sweet combination outdoor living project that includes a patio, pergola, outdoor fireplace and privacy screen. The homeowners were upfront about their budget. Their Archadeck of Austin designer sat down with them to go over all of the specs, materials and costs for the project. Together, they worked out a cost-effective plan that addressed the homeowners’ needs and wants — within budget. 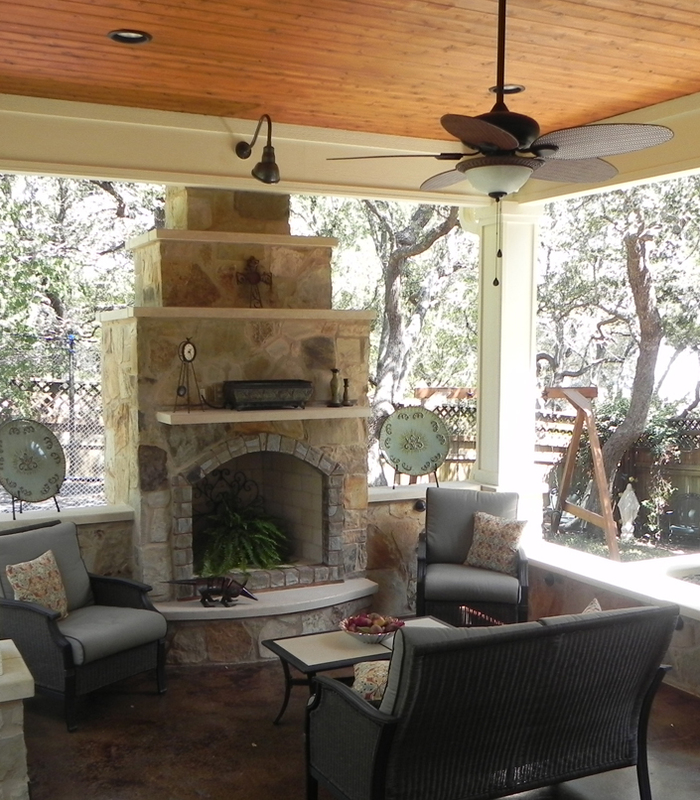 The clients were looking to add a shade structure to the back of the home and wanted to include an outdoor fireplace. 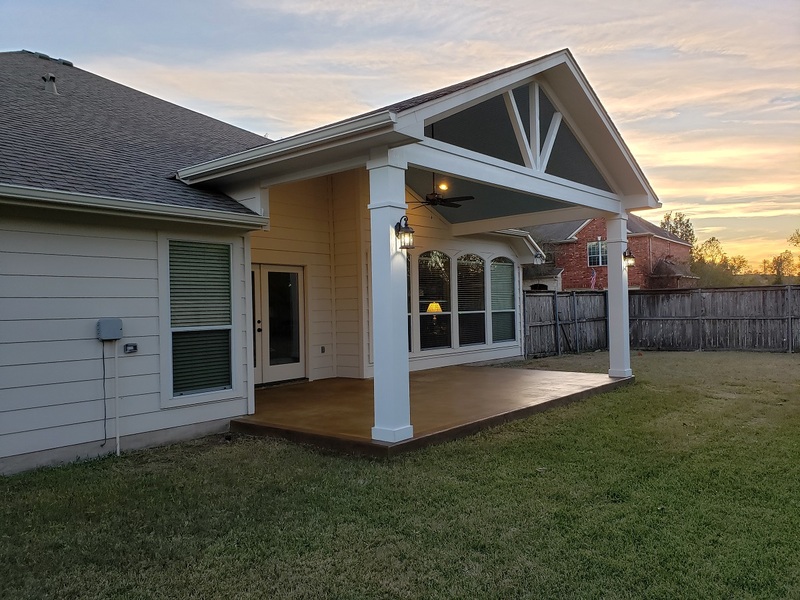 Their home had an existing covered porch at the back door. 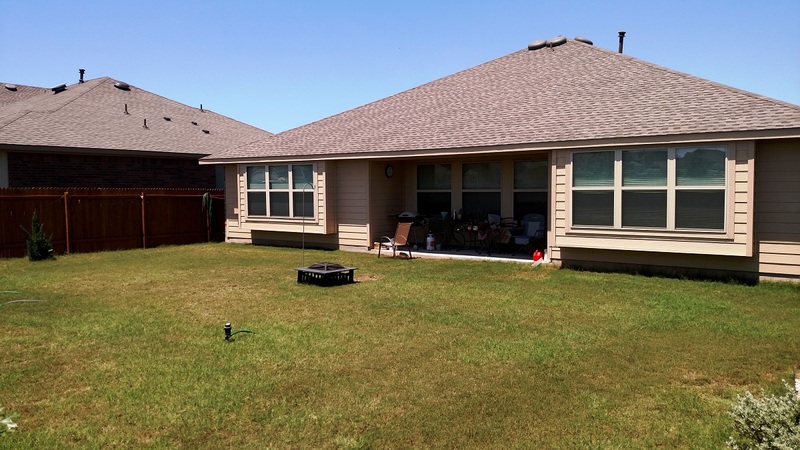 The property was not right for a deck because there’s no change in elevation behind the house. Decking “at grade” is not a good idea. 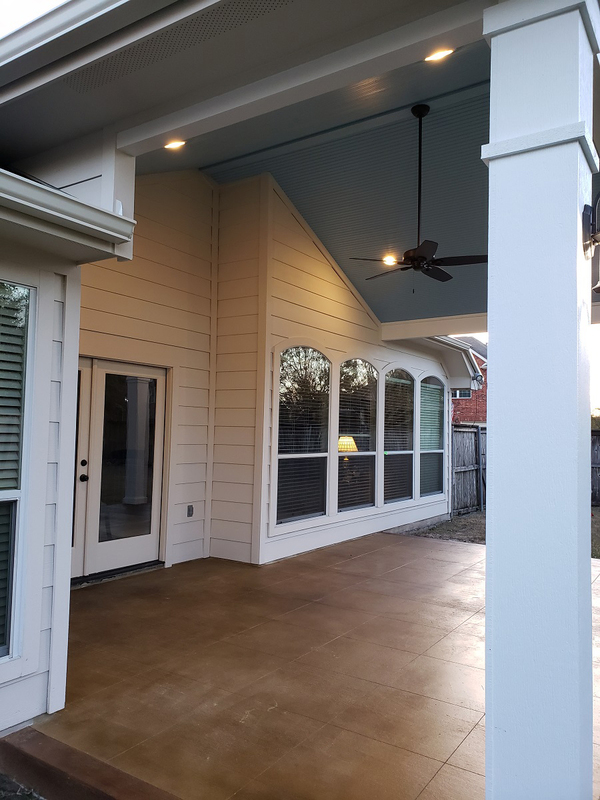 So they wanted a patio to extend outward from the existing porch and serve as the base for their new shade structure (pergola) and outdoor fireplace. 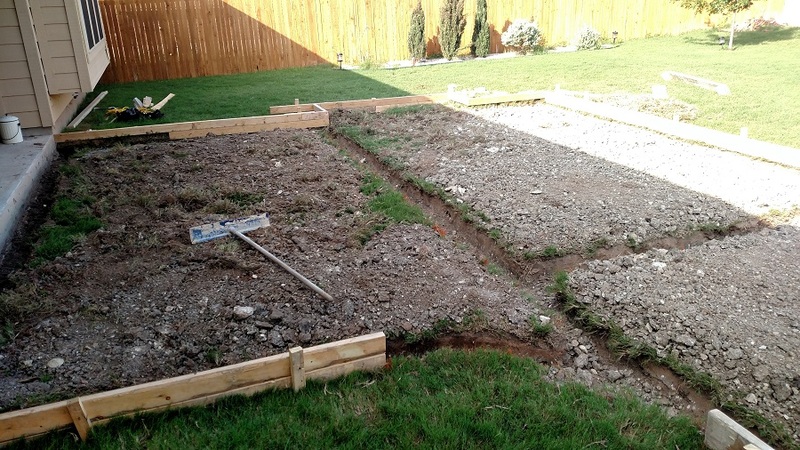 Starting with the custom patio, we always dig trenches about 12″ deep and lay a beam system within the perimeter of the patio before we pour concrete. These steel beams reinforce and stabilize the patio to prevent the concrete from settling over time (or in response to ground movement). This way we know we’re providing a strong and stable pad for the concrete patio. Keep in mind, concrete will always crack, no matter what. 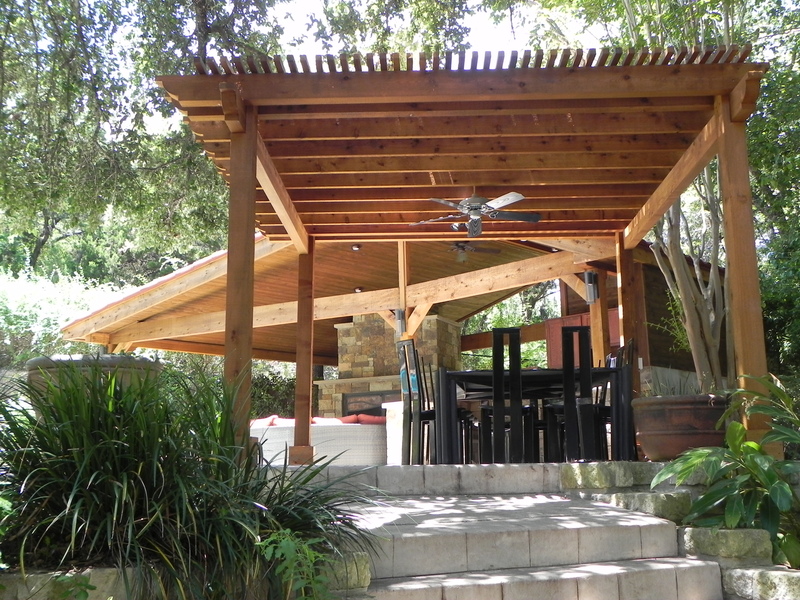 The added perimeter and internal beams provide more stability to help reduce the eventual outcome of any concrete deck or patio. 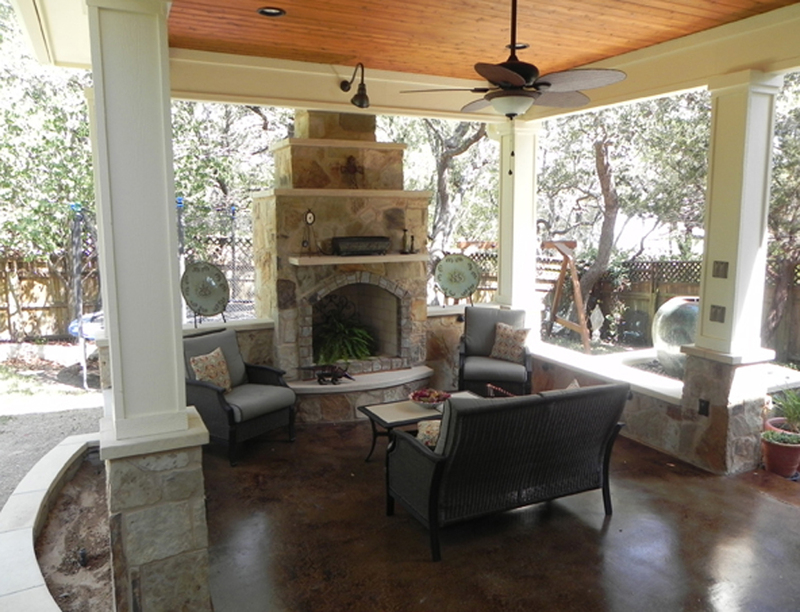 For this patio, we added a textured and stained concrete overlay to the surface for visual appeal. 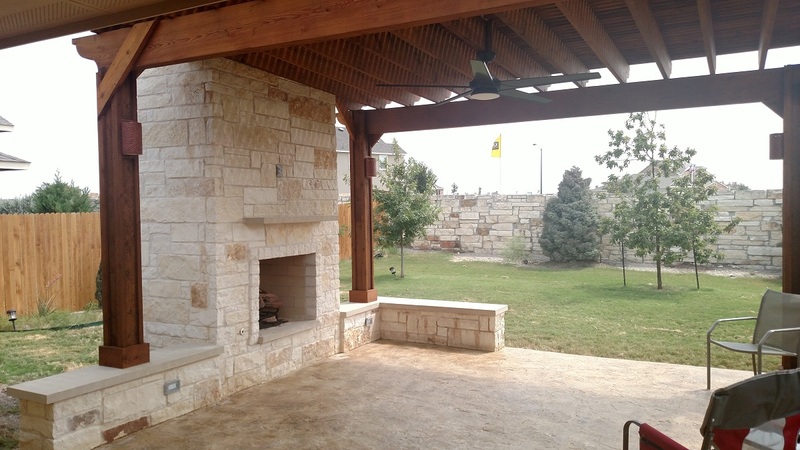 For utilities, we ran conduit and a gas line from the main meter to the rear of fireplace for service, and we ran wiring for electrical access at the fireplace and at several other points around the patio as well. 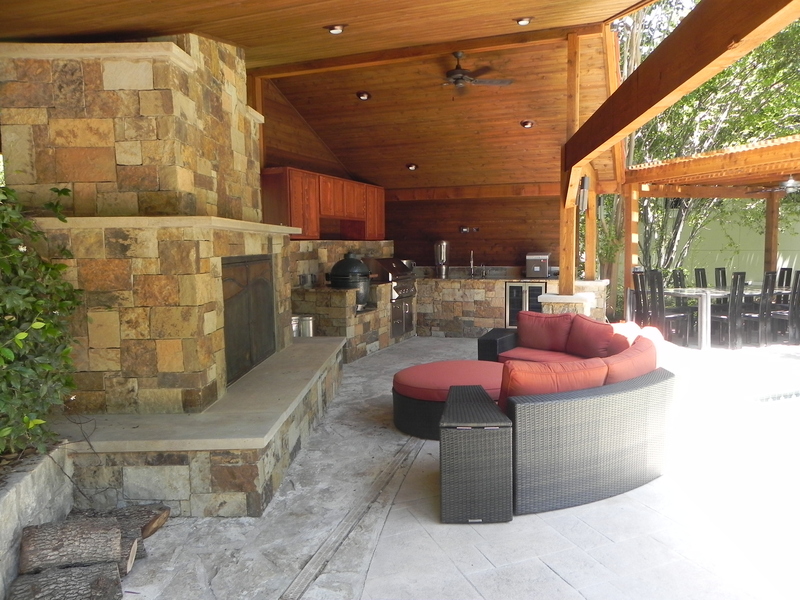 We built the gas-burning custom outdoor fireplace with a combination of Nicotine and white flagstone. The Nicotine color is white with deposits of yellow and gold running through it, and the interplay of these colors mimics the variations in the patio’s textured-concrete surface in an interesting way. 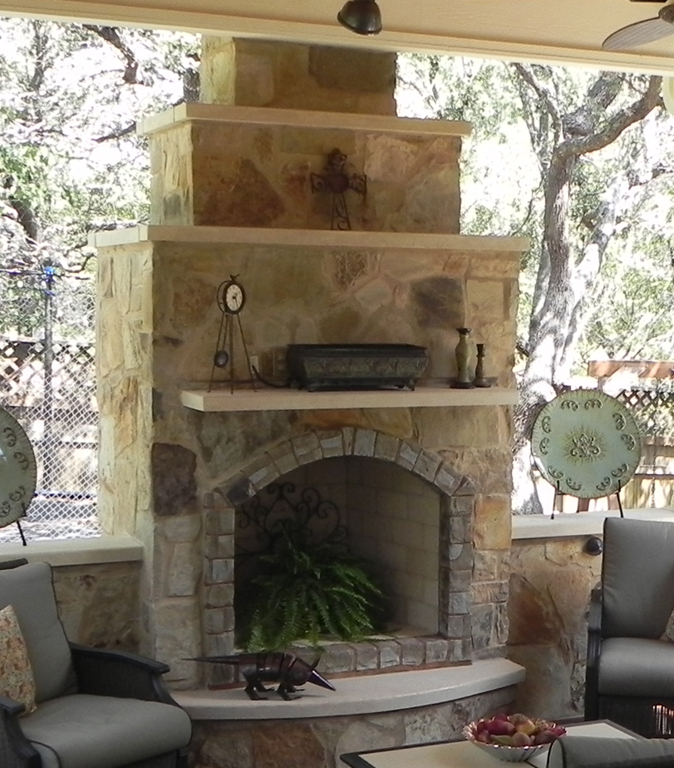 Extending from the fireplace, on both sides, is a low stone wall that is extremely practical in two ways. 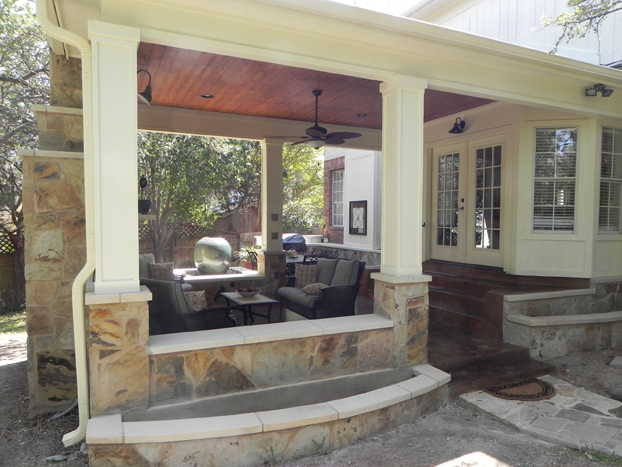 First, it creates a visual boundary for the patio, and second, it provides seating. The bench surface on the wall is made of smooth Lueders stone, one of our favorites. 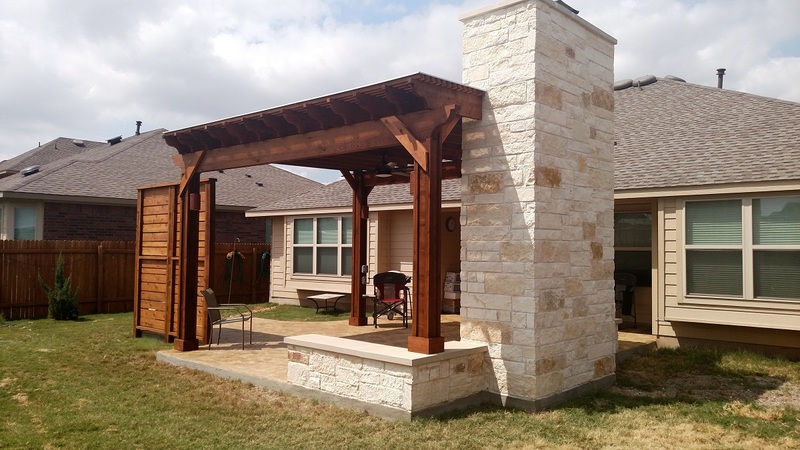 The freestanding pergola is stained cedar, and over the top of the pergola we added a Polygal cover to deliver maximum shade benefits. 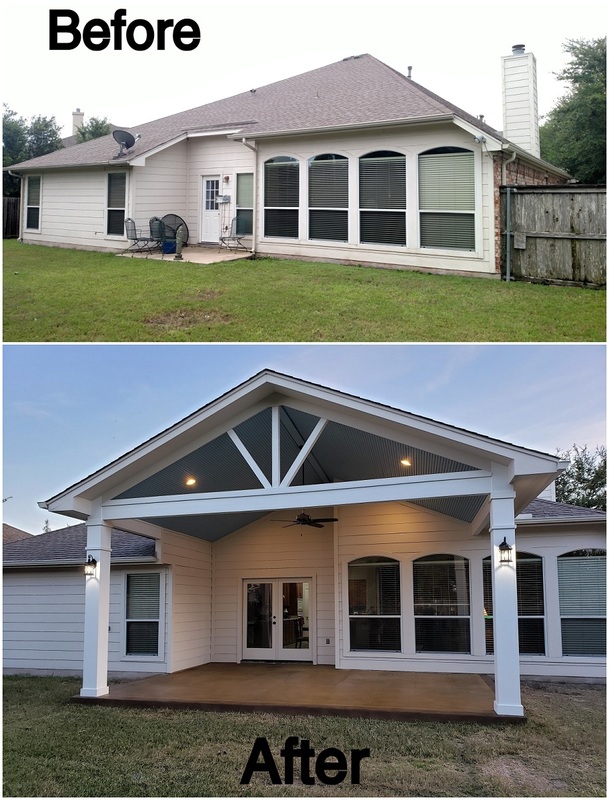 This durable covering is an affordable way to add protection from rain as well as from the sun’s rays. 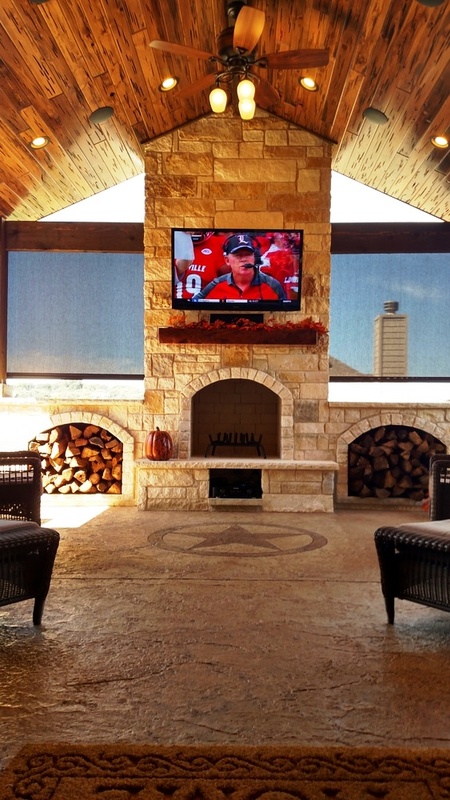 It’s waterproof and it blocks UV rays, making the patio enjoyable regardless of the weather. 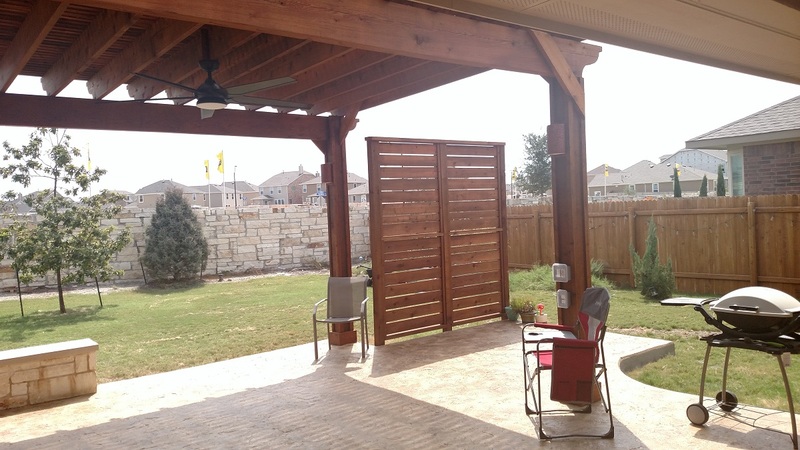 Beside the pergola, we installed a privacy screen, also made of stained cedar, because the homeowners plan to add a hot tub to their outdoor living space in the future. Finally, we installed a flat-screen TV above the mantel for the homeowners. 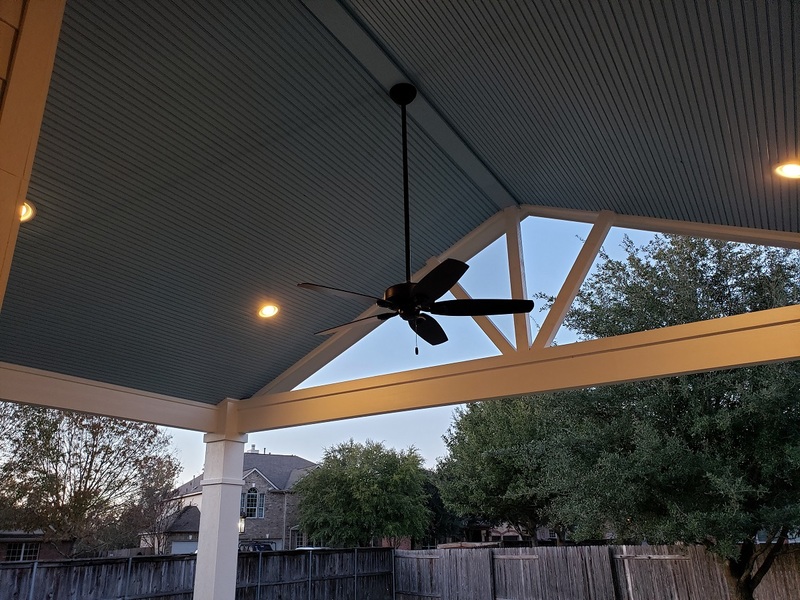 Their outdoor living space comes complete with a remote control for the ceiling fan and to dim/control the lights: the comforts of the indoors brought outdoors. 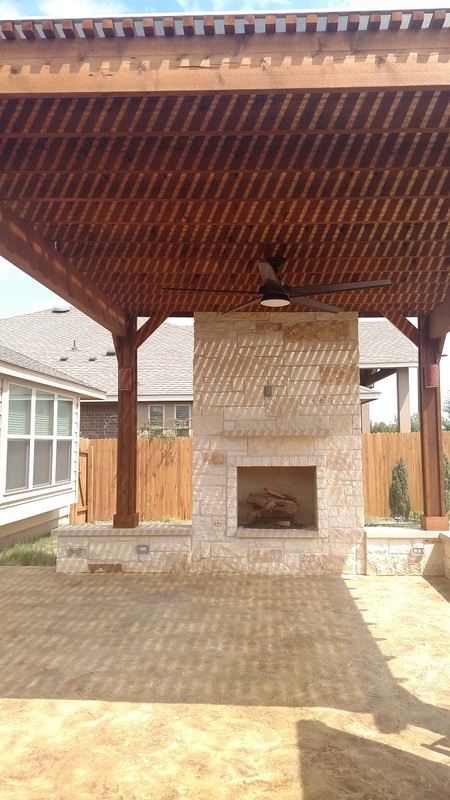 If you would like to learn more about how we can help you create an outdoor living project on a budget, contact Archadeck of Austin today at (512) 259-8282 or via email at jim.odom@archadeck.net to schedule a free design consultation.